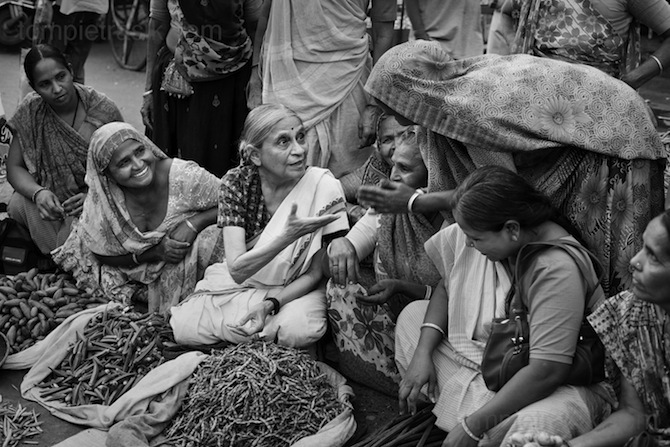 Ela Bhatt meets vegetable vendors in the city of Ahmedebad. Thanks to SEWA, such workers have won legal protection for their trade. Ahmedebad. Ela Bhatt founder of SEWA (Self Employed Women’s Association of India) and a member of The Elders meets SEWA vegetable vendors in the Danapith area of Ahmedabad’s old city. Uniting under the banner of SEWA over 30 years ago, these women no longer have to bribe the police or corporation officials in order to keep their stalls. A court order protects their trade and the SEWA bank has allowed them to escape the exploitation of money lenders. February 25th 2010 Mabel van Oranje, CEO of The Elders on a visit to meet members of SEWA (Self Employed Women’s Association of India) who work in the salt pan industry in the village of Halvad.